I had never heard of Complete Deelite until the night of my engagement/birthday. My fiancé had them custom-make an owl-shaped cake for the proposal as well as my birthday celebration. I was at a loss for words when I saw the cake. Each and every inch was beautifully decorated. The owl was covered in chocolate heart-shaped feathers. There was also a treasure chest sitting next in front of the owl with the message “will you marry me?” hidden inside. I have to say this was definitely one of the most memorable gifts I have ever received from my fiancé. 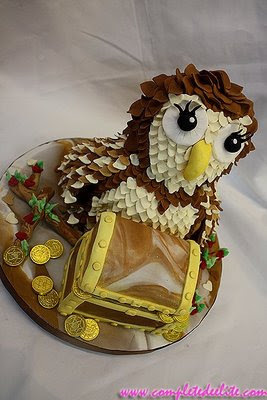 There is also the making of the owl cake video, which I can’t help but tear up a little bit every time I watch it! I must have watched it over 100 times! Thank you Complete Deelite for making this a memorable night!